Questions About Dead Whales on California Coastline – Neptune 911! The foul-smelling carcasses of whales are attracting a veritable swarm of marine biologists to California beaches in what has so far been a futile effort to figure out why so many of the blubbery beasts are washing ashore. The latest leviathan, an unidentified species, rolled in with the surf days after a 28-foot juvenile gray whale washed up Saturday on Portuguese Beach along the Sonoma Coast. On May 19, a gray whale washed up in Half Moon Bay just as officials in Pacifica were burying two recently beached whales — a humpback and a sperm. Another gray whale was found on a Mendocino County beach last week. 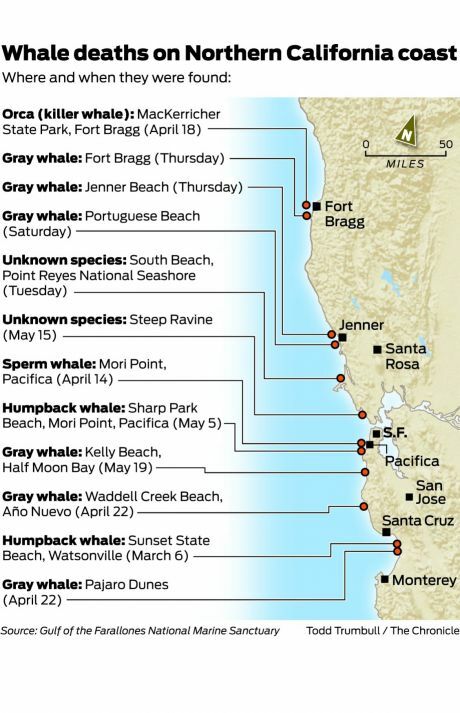 In April, two gray whales came ashore in Santa Cruz County, and a killer whale was found near Fort Bragg. The death toll is in many ways a normal part of the annual gray whale migration from Mexico up the coast to Alaska, which typically concludes this month. But experts are confused by the number of species, ages and conditions of the whales they are finding. Frances Gulland, the senior scientist for the Marine Mammal Center in the Marin Headlands, said the last time there was a large increase in strandings was in 1999 and 2000, when 40 dead gray whales were found on beaches in the Bay Area. Gulland said the stinky surge corresponded to a 25 percent decline in the overall gray whale population. Scientists believe the die-off had to do with a change in the distribution of ice in the Arctic, which may have cut short their feeding time. The El Niño weather pattern might have also played a role. The current death throng is much smaller. Six of the dead were gray whales, but Gulland said they were so badly decomposed that they have not been able to determine the cause of death. In a typical year, one or two gray whales wash ashore, she said. “We’ve got more than a typical year, but nothing like the dramatic numbers we saw in 1999 and 2000,” Gulland said. Marine scientists are looking at a variety of factors, including environmental changes, food distribution, shipping and predator behavior. The problem, Gulland said, is that the whales are turning up in different places, have included a variety of different species and appear to vary in age from juveniles to elderly adults. At least one of the big mammals showed evidence of being hit by a ship. Two others were missing limbs, an indication that they were either attacked by orcas or got entangled in fishing gear. Some were very young, and others appeared to be very old. The only thing consistent, she said, was that the remains had very little in common. Gray whales, including mothers and their calves, migrate from Mexico to the Arctic between February and May. Most leave their breeding grounds in Baja California in April to travel north. Some 19,000 gray whales participate in the migration, according to marine biologists. Food is not an issue, Gulland said, because the animals don’t eat during the northern migration. Killer whales are a likely culprit in some of the deaths. The orcas patrol Monterey Bay and ambush mothers and their calves as the leviathans attempt to cross a deepwater canyon there. The violent drama, involving fleeing whales and pursuing packs of orcas, is an annual extravaganza of death that scientists say has been growing in intensity as the number of whales and orcas increase. At the migration’s peak, 35 whales and calves a day swim along the coast hugging the shore trying to elude the predators. The whales feed in Alaska during the summer and then turn around for the return voyage from November to January. Researchers think the number of deaths this year could have something to do with a recent population increase. Both gray and humpback whales are now at or near their historic populations after being hunted almost to extinction over the past 200 years. About 20,000 humpbacks now inhabit the North Pacific. The gray whale population began to recover in 1992. There were only about 4,000 in the 1930s. In 1999, before the die-off, there were 26,600, according to estimates by the National Marine Mammal Laboratory in Seattle. Humpback whales are not migrating at the moment, but fishermen and whaling boats have recently been reporting a large number of the cetaceans near the Golden Gate, apparently feeding on an abundance of krill and an unusual influx of mackerel. Vessel collisions are also a major cause of death for whales. Blue whales — the largest creature to ever live — have not increased in numbers, and researchers fear ship strikes may be the reason, but more whales in general are getting hit by ships. It’s a big issue outside the Golden Gate, where 7,300 large vessels pass through every year. Justin Viezbicke, the stranding coordinator for the National Marine Fisheries Service in Long Beach, said whales die in the ocean every year, but they don’t always wash up on public beaches. He said prevailing onshore winds and currents this year may be pushing more of them ashore. The blubbery remnants were, after all, a historic delicacy for grizzly bears, wolves, coyotes and California condors.